Festool has a lot of great tools, and most if not all of them make use of a Systainer (Festool's tool boxes). 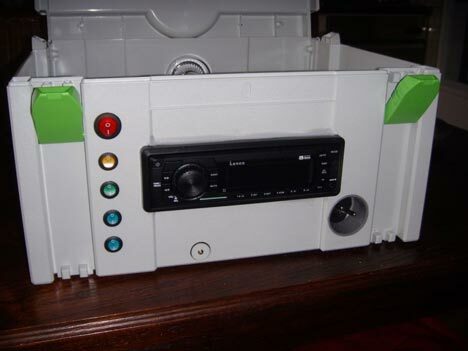 The problem for some fans is that Festool does not make a Systainer compatible radio. Fans want a radio with built in support for MP3 players, additional outlets, etc; they basically want what the latest Bosch 360 radio has to offer but in a Systainer format. What Festool hasn't built, one Festool fan named FestFan has. 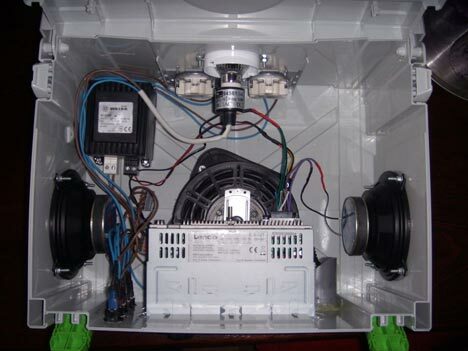 He has taken an empty Systainer III, and turned it into a customized radio. The basics behind it are simple: power, an inverter to convert his 220V down to 12 volts DC, a car radio, and a couple 40 watt speakers. A pretty good start if you ask me, but that wasn't enough for this users; he also built in a LED work light and added a couple power sockets. Systainers come in a number of sizes, so if you want to rock the jobsite with a couple 10” speakers, it is probably doable, just stay away from me.